When a priest is named to the office of Bishop he is given a number of tasks that have the value of inviting him to reflect upon his identity and his goals. He has to choose a motto and develop a shield or coat of arms. 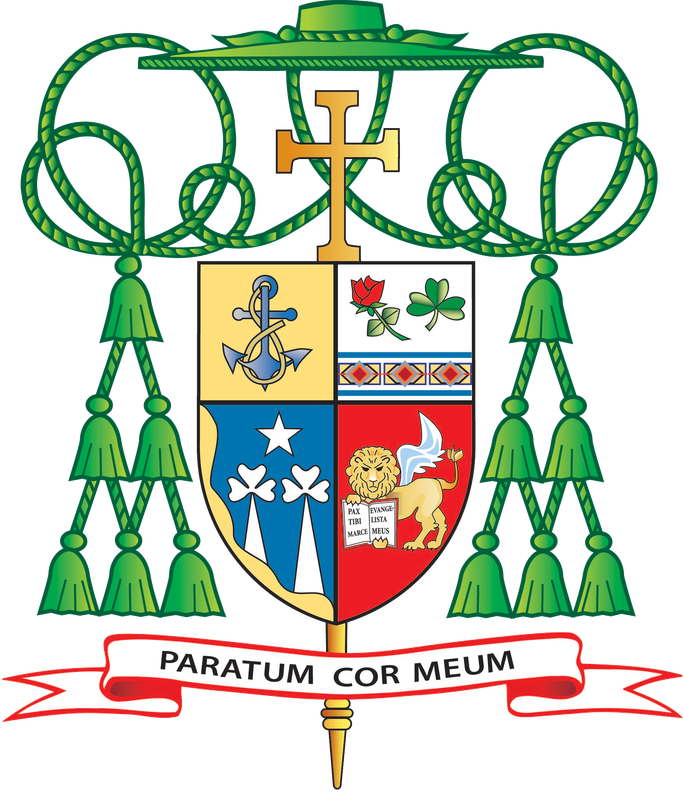 When an Auxiliary Bishop is named as the bishop of a diocese, he then has the opportunity to revise his coat of arms to include the crest of the diocese he has been called to serve. I have chosen the motto, “Paratum cor meum”, “My heart is ready”. This phrase is found in two psalms, both Psalm 57 and Psalm 108. The phrase reflects the steadfastness and the unfettered responsiveness to the will of God I would like to cultivate in my life. The motto is at the same time a homage to Bishop Thomas Tschoepe who chose this as his motto. He was a very important mentor and model in my life. On the left side of the coat of arms you will find elements of the shield of the Diocese of El Paso. The blue and white honor Our Lady under the title of the Immaculate Conception, Patroness of the United States. The wavy border symbolizes the Rio Grande River. In the diocesan crest the river surrounds the “Ysleta”, or little island, which was the first name of El Paso. The two long triangular forms represent the mountains that form the pass for which our diocese is named. They are topped by trefoils, otherwise known as shamrocks. These, along with the triangular mountains, both invoke the Trinity which is at the foundation of our Faith. The shamrocks are also a homage to the patron of our Cathedral, St. Patrick. The star above the lower image is both a remembrance of the Lone Star for which our State is named and the North Star, a reference to the full early name of “El Paso del Norte”. Of course, for us Christians, the North Star is also Christ who orients us and points us to our true home in heaven. In the upper left-hand corner is an anchor. This anchor is taken from the coat of arms of St. Pope Pius X, who created our diocese. Interestingly, the anchor, called the “Anchor of Hope”, was found in my original crest. It was a symbol adopted by an ancestor of mine named Roger Williams, a Baptist minister who founded Rhode Island, the first colony to enshrine the principle of religious liberty and freedom of conscience. I hope, also, to be effective in working with people of other faiths and to be a contributor to the good of our nation. Beginning at the upper left, the red rose is the "Rose for Life". I wanted some symbol of my commitment to the Gospel of Life, which is really an expression of my concern that the dignity of human life be respected at all of its stages from conception to natural death. The trefoil (shamrock) speaks to my Irish heritage, to the importance of teaching the Faith, and, of course, harkens back to St. Patrick, one of our Faith’s most effective missionaries. The pattern dividing the upper and lower parts of the crest is intended to honor the Native American heritage that I share and my desire to serve our first Americans. The winged lion is the symbol for St. Mark the Evangelist. St. Mark is, of course, my patron. I hope to imitate him in his service of the Apostles Peter and Paul and in his ability to effectively translate the Faith to those who needed to hear the message of salvation. The lion also happens to be a symbol of Bavaria, in southern Germany, from whence my father’s ancestors hailed. Please keep me in your prayers, that my life may honorably reflect these signs.